My question is; can I use an old drying machine outlet for these? I already made an improvised heavy duty extension cable that can accommodate the welder male plug to the three prong old drying machine female receptacle. 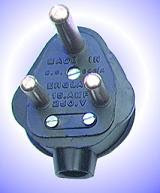 The third prong has an “L’ shape in upside down position while the welder male plug third prong has a round shape. I tried once connected the ARC Welding machine the result is not desirable. It will run the electrode but constantly stops. I end up welding with an interval of run-stop-run process. I am working on a “welder’s test stand” project but can’t finish it. It looks like to me at my simple understanding that the power supply or the ground is not all present at this old drying machine female receptacle. As soon as the welder machine is connected the sound of humming is heard. But it is not performing as I expected. You need to contact an electrician and have this done correctly. You are running a 50 amp device off of a 30 amp line. That is a good way to start a fire. This is not the type of thing you you can do with out the proper experience. This electric is getting to where you could have some real safety concerns.